No, I am not talking about the rise of artificial intelligence but rather on how we folks today are increasingly gluing our faces onto our smartphones. Singapore is ranked the highest globally in mobile penetration rate, read this here. Well, we do see almost everybody using a smartphone here, so much so that there are rising cases of zombies. 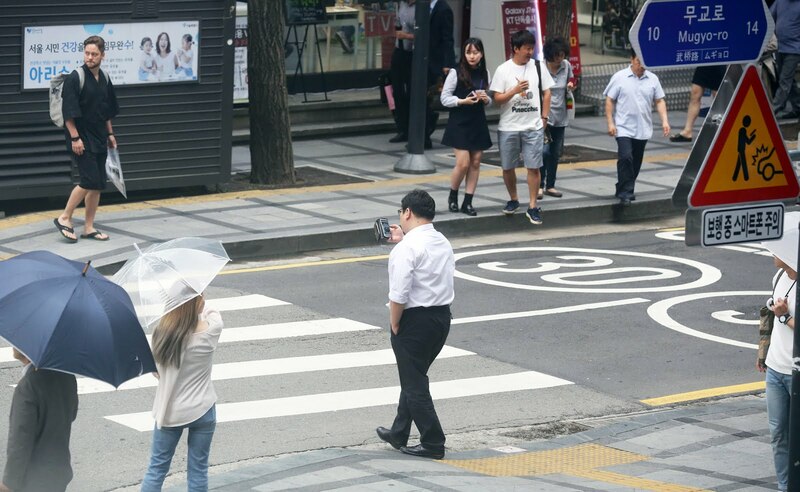 In South Korea, authorities have tried to mitigate their smartphone zombies apocalypse. Now, if you are reading this post while crossing the road, I suggest you put your phone into your pocket. If you are walking down the stairs from the train platform, please put away your phone. There were a few cases, whereby the person in front of me was watching a drama show, and she was so slow in walking down the stairs that everybody behind me was obviously annoyed. There were another instance, where I tapped on the shoulders of a guy in front of me, simply because he was walking too unpredictably while using his phone. I am not about to get stepped on in a stampede. I am sure we have been taught road safety from young to look left and right while crossing the zebra crossings and traffic lights. I make it a point till today but I observed some pedestrians just crossing the road while their faces were still glued and earbuds inside their ears. It's like as if the smartphone rips you of your senses and gives you a false sense of safety. Maybe we do need such signs like those used in South Korea too. Ever heard of the "If you see any suspicious article or person, please contact our staff or call 999" while taking the MRT? In light of recent terror attacks, I think it is being played more frequently but it seems many of us folks are glued to the screens until we probably won't know if the guy next to us left something behind or not. I am guilty of that. At times I can be very vigilant, doing my part to look around, at times I am scrolling through my Facebook feed or just turning on the screen for nothing. We take things for granted here. I am not dismissing smartphones for they have its benefits too. Accessing social media gives us the latest news on what is happening. We can plan an alternative route immediately even before reaching the station if we know of a disruption in the MRT system. But if we can use them at the right time such as not using it while crossing the road, or walking down the stairs or while traveling in the trains, I am sure that is a positive for our own safety and our loved ones too. The next time you whip out your phone, make sure if it's safe to do so for yourself and others. Remember, you are in control.